I have mentioned previously that I’m part of a book club my wife Joan belongs to. Joan suffers from Dementia of the Alzheimer’s type and no longer reads books but enjoys the book club meeting activity. So I read the books and attend the meetings with her. As a result I end up reading books that I would likely not consider reading otherwise. Pope Joan is one of them. However I find that even if I’m not impressed by a novel, I usually come away knowing more than I knew before I read it. For example, the Pope Joan book provided examples of the Dark Age practices, believes and conditions that made that part of history come alive in my mind in a way that it never had before. The story takes place in the ninth century, in the middle of the Dark Ages. The Pope in Rome ruled Europe. The Cristian religion dominated all facets of governance. The church interpreted the written word and from it provided rules for human behavior and what to do if those rules were not followed. This was the world that Pope Joan had been born into in 814. Joan emerges as a super woman, super intelligent and super capable in every way. In the ninth century a woman with such capabilities faced a frustrating future. An unlikely set of circumstances allows Joan to be exposed to sources of higher learning at an early age. For a woman in the dark ages her education had little use, but again an unlikely set of circumstances provided an opportunity to overcome her limitations as a woman. The place where Joan lived was raided by Vikings, who plundered, killed and raped the local citizens. Joan changed into a man’s clothes to escape the fate of other young women. Once she had made the change she realized she no longer faced the limitations of a woman. This put Joan on a path that through a number of additionally unlikely circumstances led to becoming Pope John. During this time she also becomes infatuated with a handsome knight named Gerold, older by quite a bit and married when they first met. Despite the obvious difficulties involved, the knight and Joan became close and soon became more than just friends. I found the story described well researched information about life and conditions during those dark years in Europe’s history and in how the church dominated the politics and everyday lives during that period. As novels often do, the book provides a better understanding of the Dark Ages than many non-fiction history texts would. I found the story wondered at times and I alternated between being and bored and at other times absorbed in the novel. I found the parts of the novel dealing with Joan and Gerold lacked the implied passion in the telling. 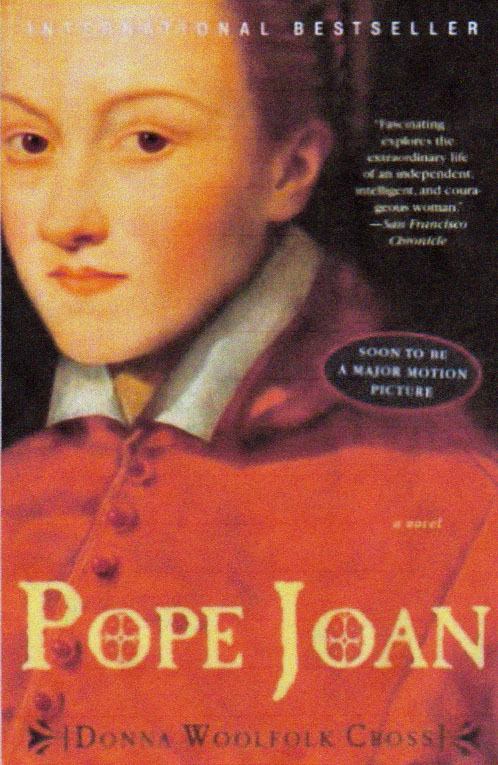 In the Author’s Note, the author discusses the reality of the woman who became Pope Joan. She admits there is no proof that there ever was a Pope Joan but writes seven pages in the Author’s Note strongly implying that such a person did exist. The current Wikipedia entry on the subject states, “The story was widely believed for centuries, but modern scholars regard it as fictional. I gave Pope Joan three stars in an Amazon review.